AP Services, a product and service brand of Curtiss-Wright, has state-of-the-art gasket manufacturing technology using CNC driven water jet cutters. Style 300 is a high quality, compressed fiber sheet designed for extreme service. Carbon and graphite fibers combined with a heat-resistant, nitrile binder allow for high temperature service. Because of this sheets excellent physical property, it is widely used in the power generation industry due to its high temperature capabilities as well as resistance to oils and solvents. Has excellent resistance against steam and strong alkalis. Style 300 can be used for sealing water, steam, fuels, lubricants, alkalis, and weak acids, seeing maximum temperatures to 800º F and maximum pressures to 1450 PSI. Continuous operating temperature 552 ºF. The Pressure x Temperature Factor for Style 300 1/16” is 600,000 max. 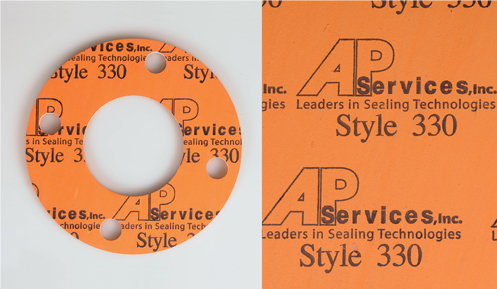 Style 300 is available in sheets and pre-cut gaskets. AP Services, a product and service brand of Curtiss-Wright, has state-of-the-art gasket manufacturing technology using CNC driven water jet cutters. Style 325 is a high quality sheet composed of non-asbestos synthetic fibers and a heat resistant nitrile rubber binder. This non-asbestos sheet has low chloride content (below 100 ppm) and has good anti-stick properties, preventing flange corrosion and reducing maintenance time. Excellent sealing capabilities and chemical resistance, along with good creep relaxation make this a great general purpose sheet. Style 325 can be used for sealing gases, water, organic acids, alkalis, and a wide range of applications seeing maximum temperatures to 500 ºF and maximum pressures to 1450 PSI. Continuous operating temperature 375 ºF. The Pressure x Temperature Factor for Style 325 1/16” is 350,000 max. 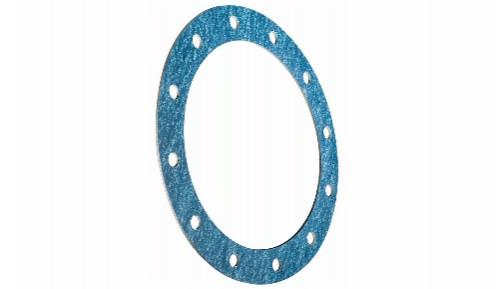 Style 325 is available in sheets and pre-cut gaskets. AP Services, a product and service brand of Curtiss-Wright, has state-of-the-art gasket manufacturing technology using CNC driven water jet cutters. Style 330 is a high quality commercial grade compressed fiber sheet designed for a wide range of services. Synthetic, non-asbestos fibers combined with a modified, heat-resistant SBR binder allow for high temperature service. Style 330 has enhanced controlled swell properties that create a tight seal when exposed to fluids and liquids, making an excellent sheet for low bolt load applications. This sheet provides great flexibility, good shelf aging resistance, and long service life. Style 330 is recommended for hot oil, gases, saturated steam, ammonia and applications under 500 ºF and pressures to 1450 PSI. Continuous operating temperature is 375 ºF. 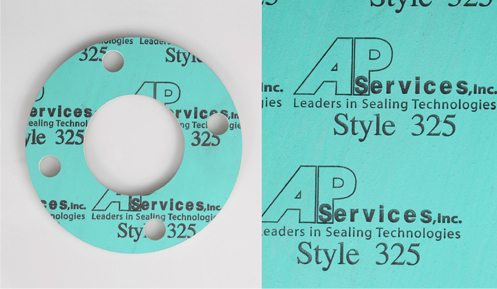 Style 330 is available in sheets and pre-cut gaskets. Garlock Style 3760 compressed sheet is made from an aramid fiber and rubber binder. This new gasket technology actually creates its own load when contacted by oil or water media. This revolutionary material does not degrade in contact with oils and adapts easily to all types of flange design, so its ideal for a broad range of applications. Twice as soft as conventional gaskets, MULTI-SWELL is easy to cut and readily conformable even to irregular flanges, ensuring tight seals with lower loads. Since its crush strength is many times higher than a rubber gasket, it can be safetly used in applications that would typically crush elastomeric gaskets. Multi-Swell is recommended for oil and water applications up to 400 (° F) and 500 (PSI). The Pressure x Temperature factor for 1/16" Multi-Swell is 150,000 Max. Multi-Swell is available in sheets and pre-cut gaskets. Thermiculite® 815 is a high temperature sealing material based on a blend of thermally and chemically exfoliated vermiculite. It offers benefits compared to both graphite and mica based sheet sealing materials. As a silicate based mineral vermiculite is free from the oxidation problems suffered by graphite in elevated temperature service in the presence of atmospheric or product stream oxygen. Unlike mica based sealing materials proprietary processing results in exfoliation of the vermiculite crystals producing a gas tight structure. The re-structured vermiculite is bonded to a 316 tanged stainless core enhancing handling characteristics and bow-out resistance. Thermiculite 815 is primary designed for use in both standard and non-standard flanged connections in elevated temperature sealing applications where oxidation may be of concern. Typical applications and industries include incinerator combustion flues, mineral acid production, metal and ore processing, propulsion and genset exhaust systems, titanium dioxide production, steam and gas turbines. The maximum temperature for Thermiculite 815 sheet is 1800°F (982°C). The maximum pressure is 2900 psig. 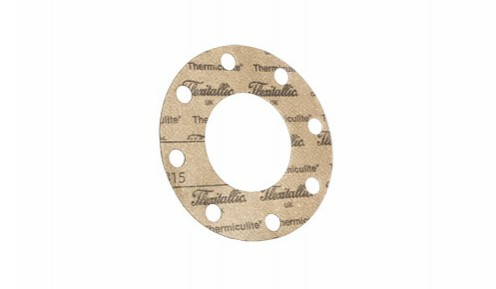 Thermiculite is available in sheet and pre-cut gaskets.